The fitness section allows you to plan your workouts according to your goals. 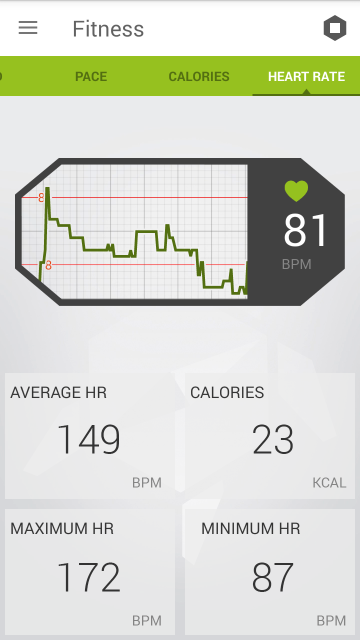 You will need a Heart Rate sensor to use certain functions described in this section. 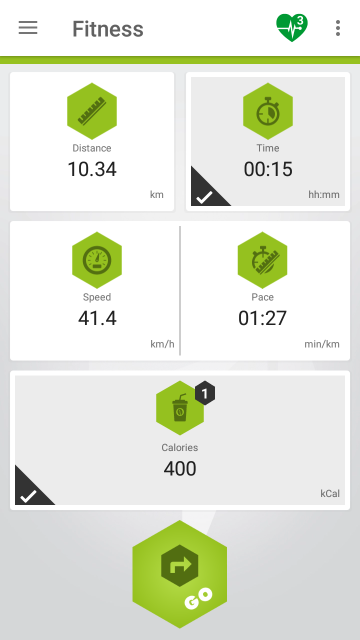 To start a workout session, open the ‘Fitness’ screen and set your goal. 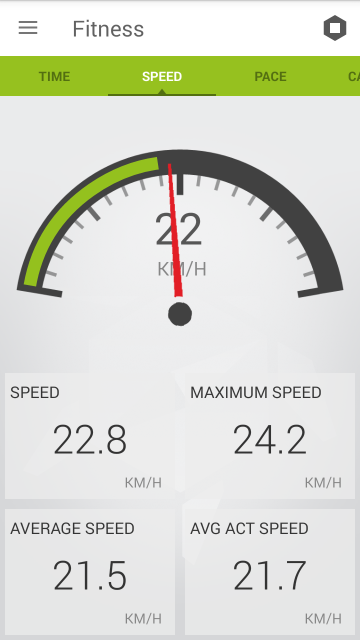 Tap on the corresponding icon and enter the desired/applicable value (Distance, Time, Speed or Pace). If you want to exercise while heading to a certain destination, tap the Further options button at the top right of the screen. Select Plan and add your destination/preferred route. The Plan option will take you to the ‘Route preview screen‘. In this case, however, your default starting point will be your current location. This can be modified by tapping the Undo button and selecting another location. 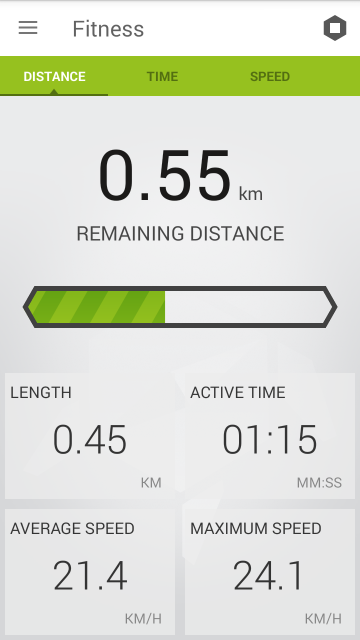 The radius of the blue circle around the starting point is the distance selected on the ‘Fitness’ screen. 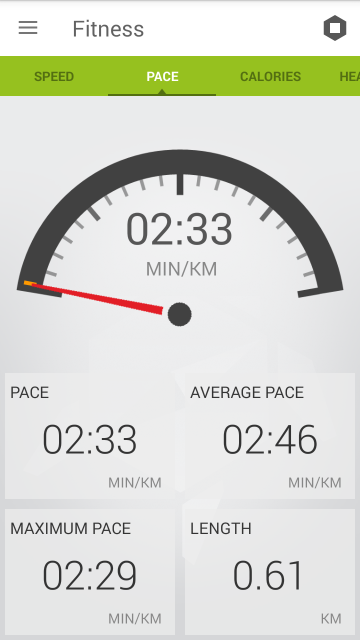 You can also race yourself by trying to beat the time of your previously recorded routes. To do so, tap the Further options button and select Race. 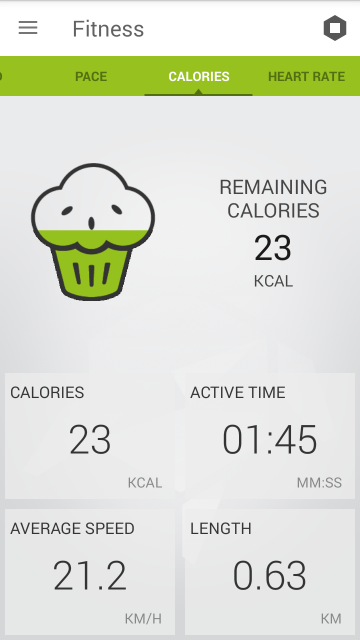 You can select a food/beverage you recently consumed by tapping the ‘Calories’ pane. If the list doesn’t contain what you ate/drank, select ‘Custom calorie’ at the top of the list and enter the appropriate value. You can also modify the presets of other foods/beverages on the list. When you are done, tap the Heart at the top right of the screen and set the intensity of your workout. This means selecting a heart rate range that you’ll try to maintain during your exercise. 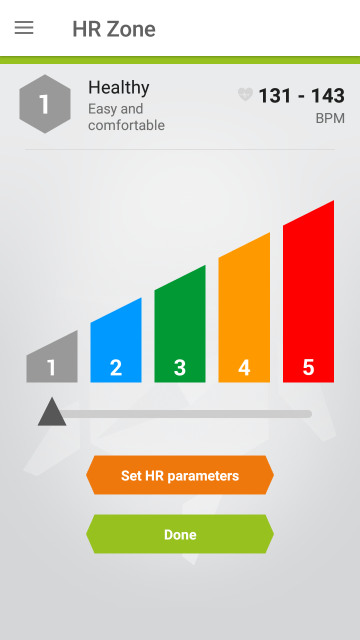 You can edit your personal settings within this menu by tapping the ‘Set HR parameters’ button. When you are done, tap your phone’s ‘Back’ button. 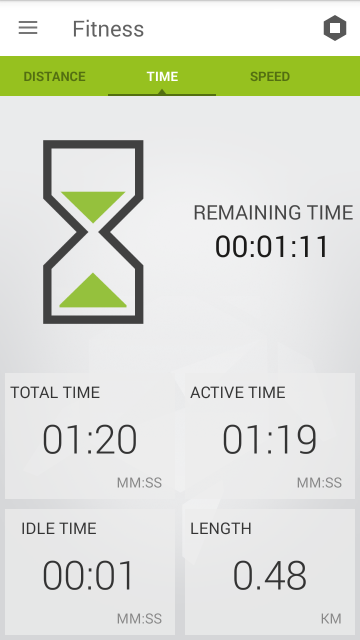 If you are satisfied with the selected intensity, tap the ‘Done’ button and then select ‘Go’ to start monitoring your progress. There are multiple tabs to choose from (in the green bar at the top of the screen) – these visualize different kinds of data. Under the main computer, you will find four panes: these can all be customized by tapping and holding them until the list of available computers appear. You can stop the exercise any time you want using the button at the top right of the screen.